Lore Clothing is a great studio out of California that produces some great horror movie-inspired t-shirts. I've done a few designs for them, great guys to work for and purveyors of excellent dismal distaste! I can really get behind these fellas. 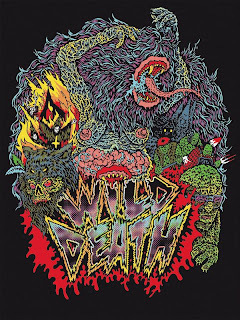 This design is called Wild Death. It's inspired by modern Lovecraftian rural Swamp Yankee horror. The story goes that in 1987 a fading farming community located outside an ever-expanding liberal arts college finds it's conventional foundations rattled by a large influx of bohemian art students, professors, and artists. The old-timers and the few young people that never left begin to see their small world quickly change when an old baptist church is torn down to make a field for an organic farmer's market. It all begins when it's discovered that the church housed a strange ancient fountain once thought to be only a Yankee tall-tale that tells of Native American Demon Witch and her cursed fountain. It all ends in Wild Death.